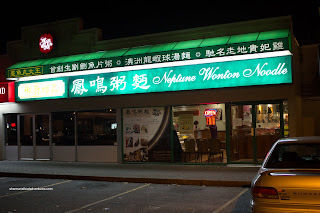 Seemingly out-of-reach for our Friday night eats due to distance, Neptune Wonton House was destined to remain on my "to-visit" list. Sure, we've made it out to Richmond before after Friday hockey, but with gas prices these days, the premium paid to drive out there just doesn't seem worth it. However, never fear when Gordo is near. You see, Gordo has taken up Thursday night hockey in Richmond. Yup, the same group I occasionally play for at 10:15pm. Generally, I've never gone out to eat after this particular pick-up hockey session. But that was about to change... Gordo, the ever-so-willing eating partner was famished after hockey. I'm not sure if I was equally hungry or not, yet I would never let an eating opportunity pass! So Neptune Wonton, we were finally about to see how your wontons stack up to the rest in Richmond... 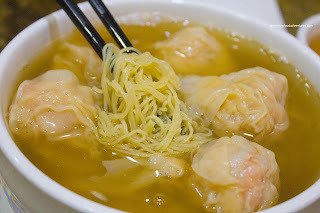 So I went ahead and ordered the Wonton Noodles, not specifying whether I wanted all-shrimp or shrimp-pork mix. I guess the default was the mix. Not a complete epic fail, but a partial fail on my part. Personally, I'm more of a fan of all-shrimp wontons. Despite this, I thought the shrimp & pork wontons to be decent. They were large and full of whole shrimp with the desired snap texture. I found the pork to be mushy, which slightly detracted from the overall texture. The noodles were cooked nicely being chewy until the last strand. I found the soup to be very light while pleasant at the same time. 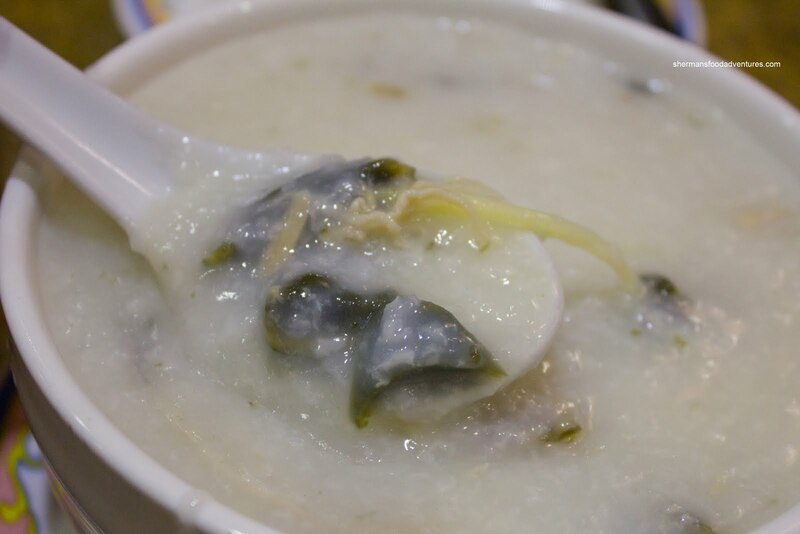 Of course I wouldn't forget about ordering a congee, so I went for the classic Preserved Egg & Salted Pork Congee. Much like the wonton soup, the congee was also conservatively seasoned. I'm sure there are some who appreciate this since it is usually an overload of MSG that makes a congee base taste good. However, when I go out to eat, I expect it and actually prefer it. Moreover, the congee started to get watery part-way through. On the positive side, there was lots of preserved egg and shredded pork. Too bad the pork wasn't salty. Gordo opted for his ol' standby - Curry Beef Brisket on Rice. As evidenced by the picture, this was a large portion with big chunks of moist and tender brisket. 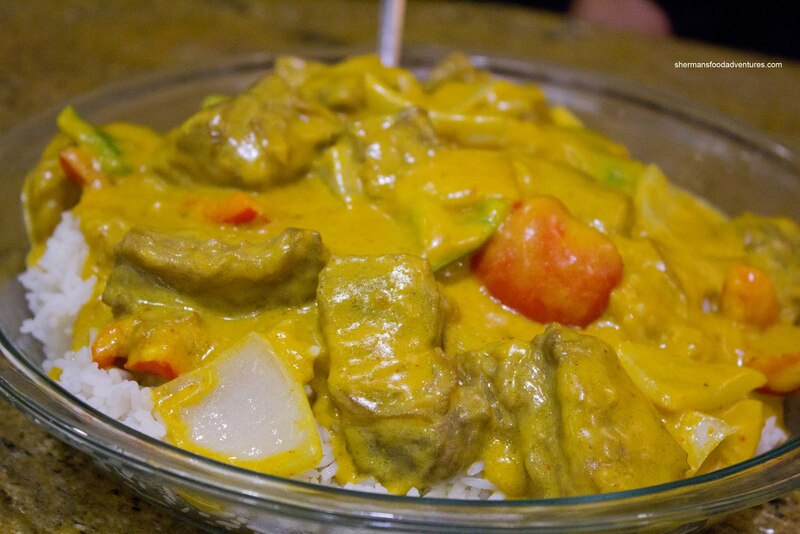 The curry was pretty creamy and resembled more of a Chinese-style Portuguese sauce hybrid. Think Mui Garden curry and you get the idea. 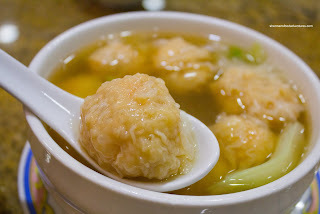 Now, unsatisfied with the fact I did not get to try the all-shrimp wontons, we returned on another Thursday after hockey. I tried to convince Snake Eyes to join us and he balked. Something about getting up for work... Wimp! So, I ended up ordering the All-Shrimp Wonton Soup. Figured I had already tried the noodles... Once again, the wontons were large. These were filled with whole shrimp which once again exhibited a nice snap. They were only lightly seasoned, where I could taste the natural sweetness of the shrimp. The only thing that bothered me about these was the amount of pork fat used as a binding agent. Of course I wouldn't only order one item right? So I took a shot at Milhouse's favourite dish - Salted Fish and Chicken Fried Rice. Too bad he wasn't there to try it. Oh right, too late for hockey, interrupts his beauty sleep. Well, in the end, he didn't miss much because the rice was bland. 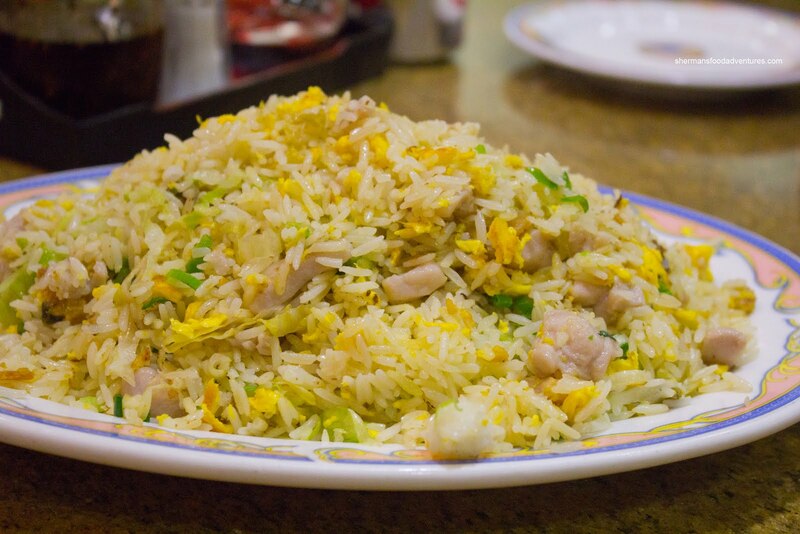 If this was salted fish fried rice, I wouldn't have known it. Might as well have called it chicken fried rice because there was plenty of tender chicken pieces and the rice itself was chewy. 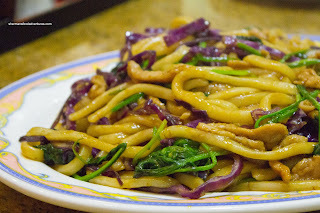 Lastly, Gordo got something unexpected in the Shanghai Fried Thick Noodles. We weren't expecting authenticity here since Neptune is a Cantonese restaurant, but what was with the red cabbage??? The color was all wrong and so was the flavour. Well, there wasn't much of it really. A lack of dark soy resulted in a lack of depth. The ingredients were prepared properly, it's just the flavours were off. As you can see, the food here is pretty much hit and miss. Stick with the regular stuff and it will be a satisfying late night meal. Go for something they don't specialize in and it can be an adventure.